I've forgotten where this info came from. Sorry! Edited by yours truly (contact me). The image came from AnimeWallpapers.com. Created by manga artist Naoko Takeuchi and turned into an anime series in 1992 by Toei, Bishoujo Senshi Sailor Moon (Translation: Pretty Soldier Sailor Moon) is probably the most famous "Magical Girl" story on either side of the water. The story of Sailor Moon and her Sailor Soldiers has drawn one of the largest fan bases for any single story, extending well beyond its intended young girl audience. Formally introduced to the United States in the fall of 1996 by DiC Entertainment, the series has only grown in American popularity (although it had its critics and a false start early into its running). The story is primarily about a young teenage girl with a unique hairstyle named Serena [Usagi - literally "rabbit"] Tsukino. At first glance, this bumbling, boy-crazy, lackadaisical crybaby of a girl would be the LAST girl you'd expect to be granted a magical transformation brooch by a talking black cat with a crescent moon on its forehead (Luna didn't believe it, either). What we discover is that under this wacky exterior is a very kind, caring, loving...and protective girl who can possess the will and determination to stand up and fight against anything the forces of evil can throw at her. The story follows her and the friends (and allies) she gains along the way in her continuing mission to defend the Earth from evils, and it is divided into five separate series. Sailor Moon (originally 46 episodes, however 2 episodes were cut for controversial content, 3 cut for timing, and the last 2 merged into 1 for both reasons for a total American release of 40 episodes) pits the Sailor Scouts against Queen Beryl and the Negaverse [Dark Kingdom], which seeks revenge on a failed attack on the Moon Kingdom during the Silver Millennium 1000 years ago. This is also the crazy beginning of the relationship between Serena and Darien [Mamoru] Chiba, whom she originally detests but eventually discovers is her long-lost lover and Prince of the Earth when she herself was Princess of the Moon Kingdom. Sailor Moon R (R meaning Romance, 43 episodes, with 1 non-critical episode cut for a total American release of 42 episodes) is itself in two pieces. The first part features two aliens and an energy-dependent alien tree. This only runs for 13 episodes and sets the stage for the real story of Sailor Moon R. It focuses around two things: Rini [Chibi-Usa], a little pink-haired Serena lookalike who literally dropped out of the sky, and a family of time-traveling enemies out to stop Rini and alter the future to their end. Late in the series, we learn that Rini (aka Small Lady) is the future daughter of Serena and Darien, who will rule the Earth together into a new age of peace. What is interesting is that the American release of Sailor Moon was abruptly stopped in the middle of this series and was not continued until loyal fans demanded that Sailor Moon R be finished. DiC finally relented and completed Sailor Moon R.
On a side note, Sailor Moon began its American life syndicated. However, the abrupt halt of the series at 65 episodes promptly dropped support and eventually caused syndication to cease in 1997 (the same year Sailor Moon completed its final series in Japan, at 200 episodes). USA Network acquired the presentation rights after a hiatus of almost a year. However, it barely completed two runs before a scheduling change pulled all cartoons from its lineup, effectively putting Sailor Moon in the dark again. However, soon afterward, Cartoon Network began its innovative high-intensity cartoon block known as Toonami. To help inject new material into the network, it acquired the rights to present two more anime series on its network. Dragon Ball Z was one. Sailor Moon was the other. The acquisition was a mutual success. Popularity for the entire block soared, and Sailor Moon fans were overjoyed once again. Furthermore, a deal was made to bring the missing episodes of Sailor Moon R, which were at the time restricted to release on Canada's YTV, to Cartoon Network and finally put some closure on the matter. Eventually, the block of 82 episodes were released into syndication, where they remain today. Then, in early 2000, there was a surprise. Toei, through its American subsidiary (Cloverway, Inc.), began work on the rest of the Sailor Moon episodes and worked together with Pioneer Entertainment to release the three Sailor Moon movies to home video. Sailor Moon S (S meaning Super, 38 episodes) introduces two unique Sailor Soldiers to the mix: Sailor Uranus and Sailor Neptune. Together with Sailor Pluto (who we first saw in Sailor Moon R), they present Sailor Moon with two sets of problems: dealing with the Bureau of Bad Behavior [Death Busters], which is seeking the pure of heart to erase the world, and dealing with the Outer Sailor Soldiers, who put the mission objective before the life of the victim and put the Sailor Soldiers' moral foundation to the test. Sailor Moon Super S (39 episodes) turns the focus from Serena to little Rini and the pursuit of dreams as an enemy from the hidden past (the Dead Moon Circus) returns during a total solar eclipse, bent on revenge against the joyful people of Earth and intent on spoiling everyone's dreams by finding the one called Pegasus, who is hiding in Rini's dreams. As of present, this is where the American release of Sailor Moon stops. There is currently no word on whether or not Cloverway will proceed into the final series. However, it is assumed that public reaction to Sailor Moon S and Sailor Moon Super Super S will affect the decision. Sailor Moon Sailor Stars (33 episodes, not yet released in America) is the last Sailor Moon series. Everyone is brought back together, and three new warriors appear that are even more unusual then Uranus and Neptune. Furthermore, one last mystery appears to top off the greatest fight in the Sailor Soldiers' lives. Bishojo Senshi Sailor Moon is about a girl named Usagi (Serena) who soon meets a talking cat. At first she freaks out, and the cat gives her information that she is Sailor Moon. The cat (Luna) gives Usagi a transformation wand which will allow her to transform. 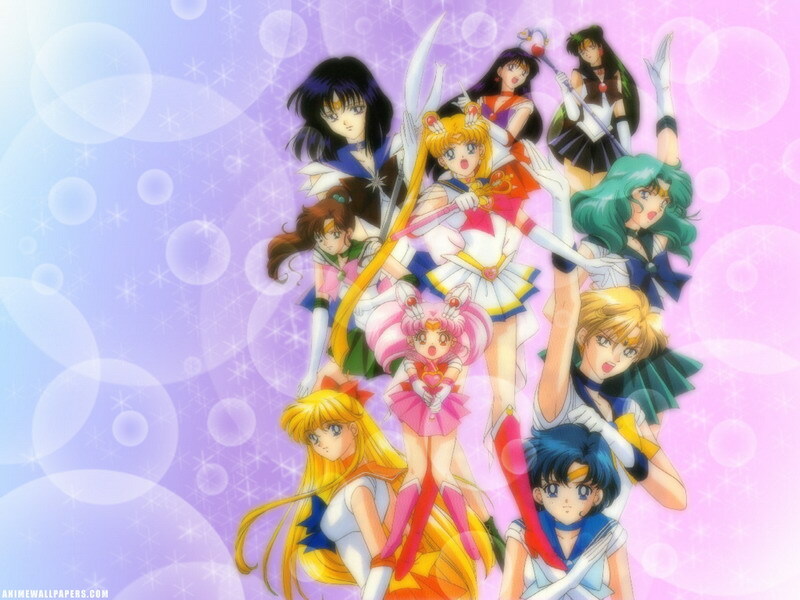 Soon, she learns she has to find other senshi (soldiers) along with the princess of the moon. First she finds Ami Mizuno, a brainiac blue haired girl, who becomes Sailor Mecury. And later, they find out who the princess really is... Usagi. The above description came from Isabelle, and was edited by yours truly (contact me).